Being a yogurt fan, I've been waiting for this book! Yogurt Culture: A Global Look at How to Make, Bake, Sip, and Chill the World's Creamiest, Healthiest Food is filled with breakfast, lunch and dinner ideas from Cheryl Sternman Rule's own kitchen and her travels to Middle Eastern countries. In the first week, I made and enjoyed 5 recipes from the book, including a warm lentil salad with yogurt swirled in; a sheet cake designed for a crowd with fresh raspberries and blueberries; and a tomato, avocado and cucumber salad over thick creamy Greek yogurt topped with extra-virgin olive oil and fresh herbs that I'll make again and again. I also discovered this dessert: chocolate yogurt pots. It's simplicity makes it brilliant. You melt chocolate and whisk in Greek yogurt with a bit of vanilla for a chilled, mousse-like quick dessert. I've made it 3 times now, and tried it successfully with dark chocolate as well, which needed a hint of maple syrup. MELT THE CHOCOLATE. Stir the chocolate slowly in a double boiler (see Yo!) over barely simmering water until completely smooth. Turn off the heat, but leave the double boiler in place over the still-warm burner so that the residual heat keeps the chocolate warm. MIX. Slowly whisk the yogurt into the chocolate, stirring with a spoon at first and then switching to a whisk. 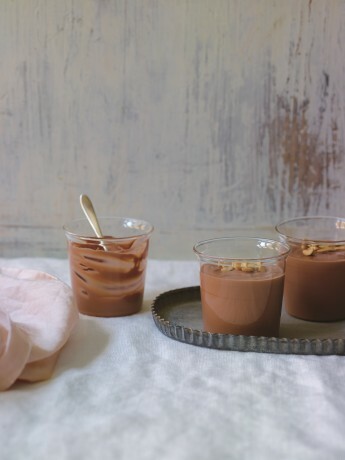 The goal here is twofold: to warm the yogurt slightly so it marries completely with the chocolate and to prevent the chocolate from seizing back up and becoming gritty. Once you’ve got a completely smooth texture, whisk in the vanilla and salt. Taste, and if it’s not sweet enough for you, add a bit of sugar (confectioners’ sugar will dissolve most easily, but you can also use granulated). Pour the mixture into five 4-ounce ramekins or little jars. CHILL, GARNISH, AND SERVE. Refrigerate for at least 1 hour to set. Dust with the salted peanuts just before serving. STORE. The chocolate pots can be refrigerated, covered with plastic wrap, for up to 8 hours. Yo! If you don’t have a double boiler, set a large, heatproof bowl (metal or glass) over a smaller saucepan filled with about 2 inches of barely simmering water. The bottom of the bowl should not touch the water or the chocolate will seize. Keep the heat as low as possible.